I found this photo on the Bakalar and Paine galleries IG promoting the show: My painting Harlem birds is the striped one on the top row, to the left of the round striped one by Jeffrey Heyne..
One of the nice things about being an artist is that you can hide away in your studio working on art but still be a part of something bigger by donating your artwork to a good cause. A few times a year, I get asked to either donate a painting or to make something (painted furniture, birdhouses, kid crafts) to support a cause. Last year I renovated a friend’s old dollhouse (from her childhood) and filled it with tiny painted furniture and original artwork. It was really fun to bring the dollhouse back to life, and I ended up donating it to an auction fundraiser for Household Goods in Acton, MA. They are a terrific organization with a simple mission: they collect furniture and household donations from people who don’t need them and distribute them to individuals or families that do. I’ve also donated to a number of art non-profits like Concord Art, Attleboro Arts Museum and the Zullo Gallery. I’m a big fan of these organizations for the educational work they do and for the opportunities they offer artists of all levels to share their work. 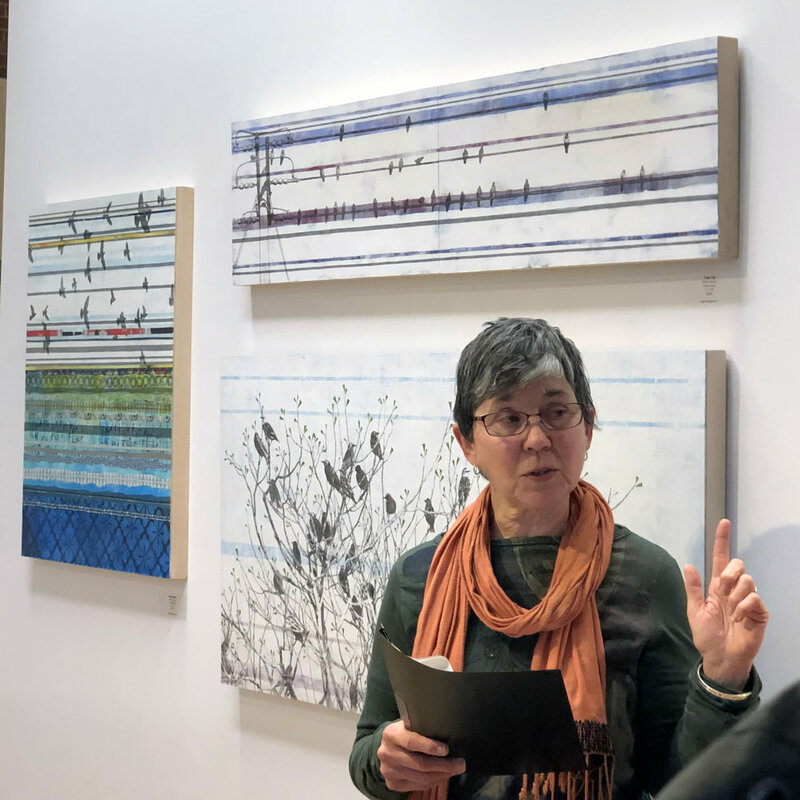 Studio art is a solitary pursuit, so connecting with a non-profit (or several) can be a great way for artists to be part of a larger art community. My piece “Something Blue” was accepted into the Artcetera Boston auction this year. This was an early Strata painting, and it was one of those pieces that never fully worked. So a couple of years after thinking it was finished, I went back into it and totally reworked it. And then recently, a poet named Matthew Goff wrote a poem about it and posted it on Instagram. How cool is that? It feels great to know that if this work sells at the auction, not only will it be going to a new home, but it will support the work of the AIDS Action Committee. My new series got a mention in the Improper Bostonian a couple of weeks ago! Just back from traveling, so posting it now. We got a nice shoutout in the Globe last week. I hope people will find the time to stop by this wonderful show. 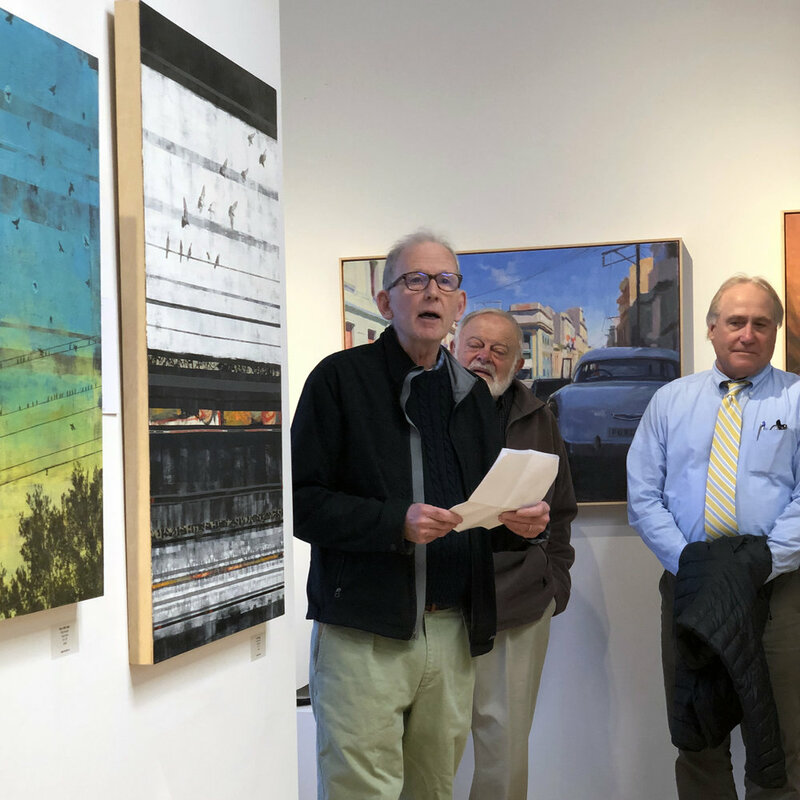 It has been a great experience working with my cocurator, Molly Paul, and of course Kate James, the director at Concord Art, and the terrific staff and volunteers that keep the place humming. And, of course, the artists! Here's the link to the article, and the text is included below. A shoutout in the Boston Globe! I've been working out some ideas for a new series on extinction/endangerment. The first completed piece will be part of the summer show at Abigail Ogilvy Gallery. I'll be sharing the walls with some incredible artwork by Ola Aksan, Adria Arch, Kate Holcomb Hale, Michael Gordon, Kristina McComb, Marie Najera and Julia S. Powell. The title of my new piece references George, the last male passenger pigeon, who died in captivity at the Cincinnati Zoo in 1910. Finally got the new show I'm co-curating installed this week. It's a big show, ten artists in four galleries at Concord Art. Amazingly everything came together despite a super tight installation window. Wonderful opening reception last night, lots of great comments, people milling around, jazz in the garden, happy artists. Very satisfying. The upstairs gallery at Concord Art. From left: Julia Csekö, Leslie Jackson, Lesley Dill, Deb Todd Wheeler, Squeak Carnwath and Andrew Witkin. My husband and I stopped by the Mass Art Auction opening reception last night. It was amazing to see the walls covered from top to bottom with so much terrific artwork. And there's an impressive array of wonderful art in the Live Auction - big beautiful pieces by Shepard Fairey, Lorna Simpson, Kara Walker, Rachel Perry, Mark Dion, Bill Thompson (to name a few) as well as two local friends, Jane Maxwell and Barbara Bosworth. Barbara teaches at Mass Art and was in the bird show I curated last year at Concord Art. And I met Jane many years ago when I was still writing books about collage and mixed media for Rockport Publishers. She shows with the wonderful Susan Lanoue. We walked around the show with Abigail Ogilvy, who then had to rush off to a meeting at the MFA. We decided to grab dinner in Central Square and I even managed to squeeze in a quick art supply run just before the store closed while Jim searched for parking. I lugged my giant bucket of gesso to Central Kitchen, where we had dinner at the bar. A perfect evening! True North was accepted into the upcoming Mass Art auction! It's a great event in Boston and provides financial support for scholarships and academic programs. A lot of wonderful artists have come out of Mass Art, including lots of friends, so I'm really happy to be part of this event. The Salon Show at Abigail Ogilvy Gallery is up till the end of January. Jim and I are planning to go to tomorrow's First Friday to see what's new at the different galleries. We'll be sure to stop in at AOG as well. My new piece is called Beyond the Sea. Into the Green is hanging at Concord Art as part of the 17th Frances N. Roddy exhibition, which is up until October 20. I also just found out that I got a piece accepted into the second annual Fay Chandler Emerging Artist Exhibition at the Scollay Gallery at Boston City Hall from September 28 to October 28. I'll be dropping off Harlem Birds today and hoping that the parking gods smile on me. Lastly, Abigail was interviewed for a piece in the Sept/Oct issue of Art New England about the new gallery scene in SoWa. I was thrilled to see my work included! I was contacted a couple of months ago by Meural, a startup company in NYC that has created a decorative frame for displaying artwork digitally in your home. The unit looks like a nicely framed artwork (instead of like a piece of technology) and can be used to show a single image or a rotation of many. The company invited me to contribute to their artist blog, the Meural Sketchbook, so I wrote about the color wasabi. The Pantone mugs I mention in my piece were a gift from a friend, Laura McFadden, who is a wonderful designer, author and artist. Check out her newest book, Knitless! I'll be part of a group show at the Abigail Ogilvy Gallery in Boston this summer. My piece, The Language of Lines, was accepted to the juried auction at this year's Summer Party at the MFA in Boston. I dropped it off at the museum yesterday. Kind of fun to be able to drive right into the loading dock with all the trucks. One of the guys at the loading dock saw my piece and said, "Wow, you've made pigeons beautiful. Usually they're the rats of the sky." BIRD: metaphor + muse got a mention in the Boston Globe!